Even though I could have named this blog post “Here’s Another Cool Thing Ariana Huffington Shared On LinkedIn”, this article by Shane Parrish entitled “Your First Thought Is Rarely Your Best Thought: Thoughts On Thinking” makes compelling points about carving out a time to think. Ain’t nobody got time for that, you might say. But we are mistaken, my friends. Our hyper-tasking tendencies only create the illusion that we’re accomplishing multiple tasks simultaneously; but in reality, we are not completing any one task fully or even partially. I think the point is that if we slow down and do a little bit more contemplative work on the front end, we will save ourselves time and more importantly learn how to honor our own authentic voice above the noise of the crowd. Pretty insightful, right? How well do you know your own thoughts? Have you ever taken the time to sort through your own tendencies and thought processes? Although a yoga or meditation practice is different from penciling in time to think, I would guess that the outcome is similar. In making time for yourself, you begin to know yourself more deeply, and what is more profound than that? Bringing awareness to your thought processes, tendencies, and patterns enables you to be an active agent in your life without living merely at the mercy of your reactions and impulses. Contemplating how you think negates living as though you’re a hamster in a wheel. And maybe the better point is that patience and time are required to arrive at your authentic and original thoughts. Some things simply cannot be done well if they are done rapidly. Maybe it’s just that there are no shortcuts to arriving at a well-conceived answer and you owe it to yourself to find out what you really think, desire, and need in your own life. What might scheduling time to think actually look like for you? Would you allow yourself that time, and if not, why? I have always been curious about Fairfield, Iowa. I remember my parents would listen to the local AM radio station in Southeast Iowa and I would hear the Maharishi school mentioned. It seemed that Fairfield and the Maharishi campus were always shrouded in mystery. No one seemed to know a lot about what was going on in Fairfield and there were whispers that it was a cult. When I was in high school, the Maharishi tennis team was very good. Members of my school’s tennis team told us about playing in Fairfield against the Maharishi school and that it just seemed “weird”. 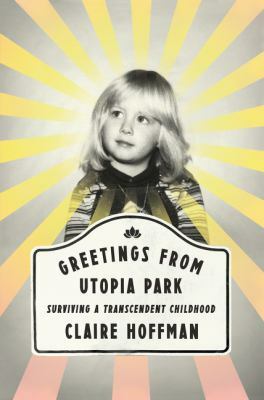 In Greetings from Utopia Park, Claire Hoffman tells the story of her and her family moving to Fairfield, Iowa when she was in Kindergarten. The family had just moved to Iowa after her parents split up due to her father’s alcohol problem. Her mother was looking for a fresh start and had already been involved in the Transcendent Meditation movement. Fairfield, Iowa was now the place to be if you were a follower of Maharishi. Claire and her older brother, Stacey, already meditated and chanted their Word of Wisdom. They were looking forward to meeting other kids that were like themselves. Unfortunately, their mother did not have the tuition money that was required to be a student at the Maharishi School of the Age of Enlightenment. So Claire and Stacey had to go to the local Fairfield Elementary School. Claire was warned by a classmate not to let kids know that she was a ‘ru (short for guru). Children at the public school did not welcome kids that were part of the TM movement. (Transcendent Movement). Soon, an anonymous benefactor paid for the school tuition so Claire and Stacey could attend the Maharishi School. Life was better for Claire. She was surrounded by children that were a lot like herself. Children that meditated and that were vegetarians. The Transcendent Movement felt very important to her and she felt like a part of something big. Hoffman tells stories of what is was like to go to school; what her classes entailed, lunches at the cafeteria and meditations. There was even a special math course. But as the years passed, life in Utopia Park became more and more expensive. Courses on learning how to “fly” while meditating became more expensive. Tuition at the Maharishi School of the Age of Enlightenment more than doubled. Stacey was pulled out of school and went to the public high school. Later, Claire joined him. The “townie” kids were not always kind. Claire had mixed feelings about Maharishi, which is quite understandable. 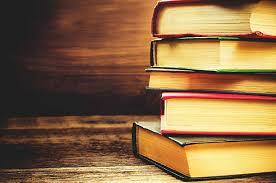 If you read the book, you will understand why. Feeling overwhelmed by the constant pressure of the noise and chaos of modern life? Bombarded by the growing intrusions of e-mail, Twitter, Facebook, and instant messaging? Step away from the cacaphony and try a day of silence. Anne LeClaire started setting two days a month aside for silence and it changed her life. 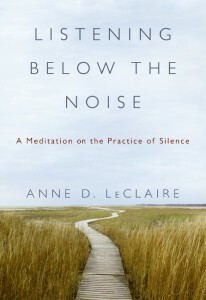 She describes her experiences in Listening Below the Noise: a Meditation on the Practice of Silence. With lyrical writing, LeClaire invites us along her journey of self-discovery, from the first difficult days when the practice felt awkward, to expanding her experience by connecting with the natural world, LeClaire offers a sensible and simple way to calm in a world of stress. Her husband and friends don’t always understand her need for silence, yet LeClaire believes it has brought her greater mental sharpness, more creativity and better health (her blood pressure lowered without drugs or diet change) She also argues that is has helped her to become a more compassionate and thoughtful person – to think before speaking, to take time to consider another point of view. The journey isn’t always smooth – she has doubts and setbacks – but she believes that stepping away from the chaos – even if only for a day – is the best thing you can do for yourself and others.